Here’s my Monday monsoon update. We’re off to a good start this year when it comes to our monsoon rain. Nearly 1″ of rain fell at TIA on Friday, and way more out toward Vail. We have two positive factors for the potential of heavy rain this week and one potentially negative. I’ll address the ‘good’ first, good if you were hoping for rain. A very favorable factor is on our side if you like rain. Tropical Storm Erick is churning to the West off Baja in Mexico. Often times we get what’s called a ‘gulf surge’ from tropical storms – even when they’re well to our south. Essentially, mid level moisture travels up the Sea of Cortez and helps us in the rain category. We still need a ‘trigger” or a mechanism to lift this tropical moisture to create rain. Enter factor #2. 2) A disturbance moving from East to West. Remember the definition of monsoon? A seasonal shift of the wind. While most of the year we look to the West for our weather, disturbances this time of year come from the East and can help lift our moist air to create the rain. A disturbance is moving our way and should help lift our moist air for good rain chances. In the following picture you can see an area of lower pressure to our Southeast- this would be our trigger. I’ve seen this too many times during the summer months. Often times despite a ‘trigger’ and good moisture, we do NOT get good rain in the Desert. This can be a function of too much of a good thing. 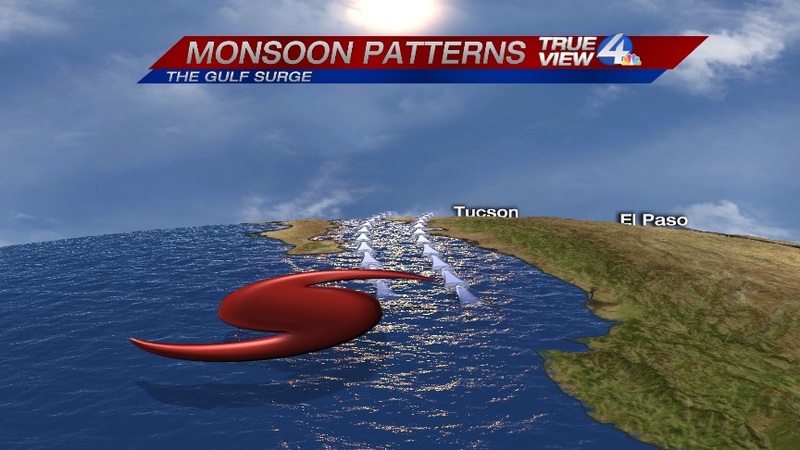 Ample storms may fire-up, many miles away from Tucson, but they can weaken sending us only clouds. If we are left with leftover clouds, we do not get warm enough at the surface to destabilize the atmosphere for convection (aka storms). So as of now, I think the two ‘good’ factors outweigh the one ‘bad’ one and parts of Southern Arizona get abundant rain this week. But keep in mind, as contrary as it may sound, waking up with sunshine is a good thing if you are hoping for rain!